Our Vancouver kids are the travelers who spent 10 months in Europe a couple of years ago. Two of those months were in Berlin. They enjoyed visiting the Christmas markets during November and December. For the past 5 years, a German Christmas market has come to Vancouver. It's set up in the Queen Elizabeth Plaza downtown. From their apartment, Owen, Ashley and I walked about 45 minutes through streets thronging with people and brightly lit shops. The market is aglow with lights and small stands featuring wares from Poland, Turkey, Germany, and Canada. We sipped mugs of Gluhwein as we strolled through the stalls looking at wooden toys, homemade soaps, textiles, ornaments and much more. Dinner was a crispy schnitzel with mushroom gravy and potato salad shared by Ashley and me. Owen had a Bratwurst with onions and sauerkraut. It was all delicious! Ashley and I posed in front of the huge Christmas tree. The Nutcracker stood outside the Kathe Wohlfahrt store which features decorations including ornate German pyramids and delicate glass ornaments. No photos were allowed. I purchased a new tree topper for our Christmas tree. In the centre of the above photo, Ashley and Owen are each eating a Rotato - a deep fried potato twisted around a stick. We had a lot of fun. I'm sure that centre photo is blurry because I was laughing so hard. After getting chilled on our walk home we enjoyed hot chocolate and a couple of games of Bananagrams before bed. The next day was packing and cleaning. I wasn't there for the actual move - that's happening today and tomorrow. Linking with Judith of Lavender Cottage for Mosaic Monday. A beautiful Market! In my country, Dominican Republic for the past two years we have a Christmas Park called "Parque Iberoamericano de Santo Domingo". My daughter published a post in her blog about it. What a fun event! Looks like it was a bit chilly. Special memories to be cherished! That is such a neat market place! How fun that you got to go. It's beginning to look a lot like Christmas - everywhere! What a wonderful adventure. The deep fried potato thing was funny. Something different, and it looks like a lot of fun. I've seen the curly potatoes in the summer here but have not tried one yet. Now the schnitzel looks yummy! What fun, Lorrie! 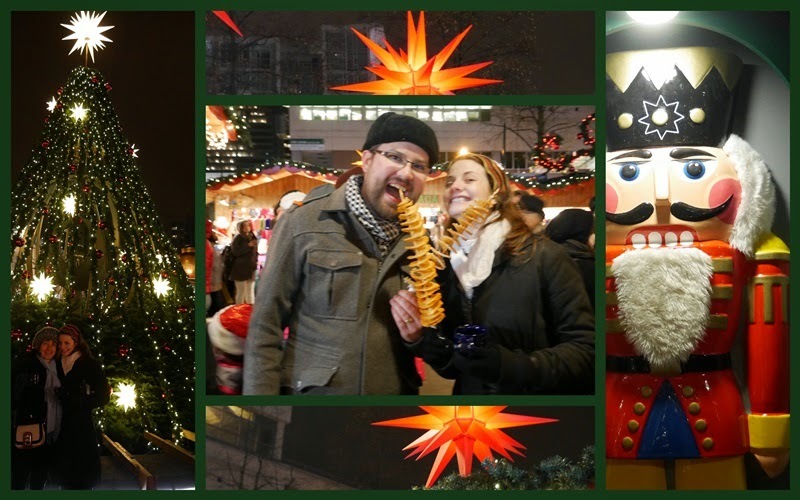 I went to Denver's German Market last week--it is always a fun event. I'll blog about it soon. Aren't those lighted paper stars so pretty! Looks like you all had fun after a busy day of packing ready for the move. When we lived in Bavaria I used to love going to the Kristkindlmarkt every year in the centre of Munich. What an enjoyable evening you had! Thank you for sharing & Have a lovely week! I wish a German Christmas Market would come to my town. We have them too, but on a very small scale. Nothing spectacular. The one in your images is much much prettier. What a great Christmas tradition to begin. Everything looks so pretty and interesting. I think we would be surprised to know just who much our western Christmas comes from German tradition. You spent a perfect day with your children and life does not get any better than that. Cheerful, colorful post! So nice to combine a little (or a lot of) work with a little (or a lot of) fun! Oh Lorrie, your post made me smile! I have never eaten a rotato in my life! Everything smells so good at markets like these, doesn't it? How fun that you could experience it all with(some of) your sweet family. Hope the move goes smoothly. I have a Christmas cake cooking in the oven..it is a big one! I'm late making it this year. That would be such a wonderful experience! I love the stars on top of the buildings. It's so nice that you got there to experience it. That looks like a very fun adventure . . . I purchased one of those potatoes things on a stick this summer . . . just because I wanted to take a photo of it to show my husband, LOL. Oh how fun! I enjoyed a similar market on a smaller scale today thanks to you. ☺ I want to have one of those Rotatoes...looks yummy! What a wonderful market and yummy food. What a fun-filled day, Lorrie, with wonderful sights and yummy food. I would love to try a rotato! Thank you for your visit to my blog. It was much appreciated. Fun. Katie and I rode the train from Edmonds to Vancouver and walked to this market and other stores last year before Christmas. We got a workout and then caught the train back to Edmonds. A long fun day. This is a great post and was so much fun to look through all your photographs. I have always dreamed of visiting Germany at Christmas market time. This would be much closer and does look like so much fun. That looks like such fun! My oldest has been to Germany twice in her young life. Her husband's grandmother still lives there so they've gone to visit. I doubt I'll ever go overseas so it's fun to visit virtually. Looks and sounds like y'all had a fun time and yummy food. Thanks for sharing it all with us.